We are, without a doubt, in the midst of a sneaker renaissance. The Fall 2017 runways were full of unexpected, amazing twists on would-be gym shoes. 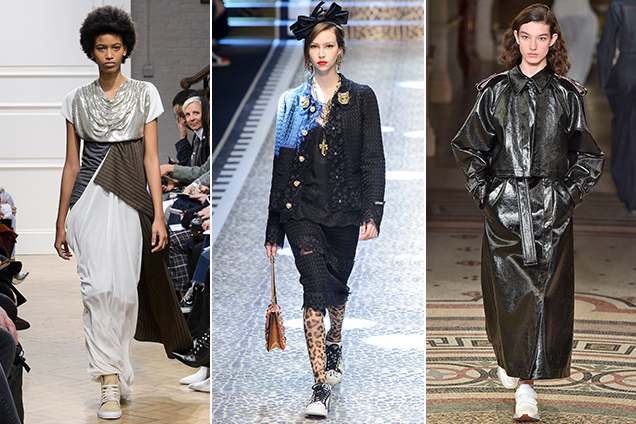 J.W.Anderson paired minimalist, metallic-tinged boxing sneakers with feather and fringe-heavy cocktail dresses. Leopard print tights complemented Dolce & Gabbana’s ultra embellished tennis sneaks. Would-be Reeboks walked Stella McCartney’s athleisure-filled runway. At this point, sneakers are so ubiquitous that Demna Gvasalia and Alessandro Michele are proposing we buy them dirty and DIYed. If there’s one thing we’ve learned by now, it’s that sneakers go with everything. Still, it doesn’t hurt to have some visual references. When deciding how to wear sneakers, the best source of inspo is the shoes’ native habitat — the streets. Editors, stylists and bloggers from New York to Milan spend their days scurrying to fashion shows in flat tops, Stan Smiths, Comme des Garçons x Nikes, etc. And while they scurry, we take notes. Click on the gallery below for plenty of sneaker styling inspiration from these sure-footed fashion girls.